As I approach a new chapter of my life, I am looking for inner peace that can only come from within. A peace that my husband can not buy, one my children can not make, and one my parents can not give. I have to find it all on my own. 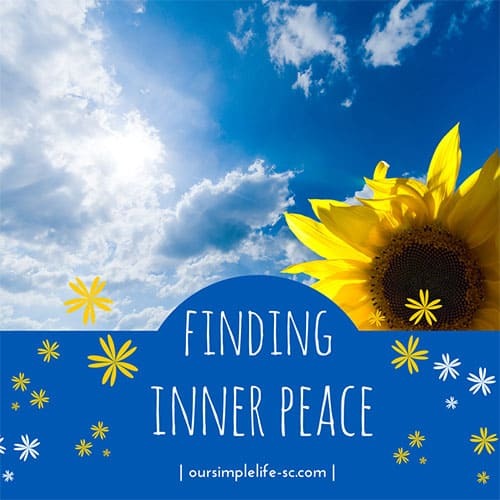 So what does finding inner peace mean to me? It means being content with who you are, enjoying what you are doing and loving the path you are on. Can you say you are happy with all of those things? The daily stresses of life can sometimes keep us from being joyful, but if you keep this short list close by, and read it often, finding and holding onto your inner peace will come much easier. And lastly…learn to trust yourself! The decisions you make in life are yours alone, own, and embrace them. You are so right that it is the little things. Being mindful is something that I am terrible at but need to work on as I know that it helps. Thanks for the sweet reminders. I need to work on just taking a breath and looking around. Smiles! Thank you for the simple tips in life that can greatly help me in attaining inner peace. I agree that by feeling good about yourself and realizing your self-worth, one can live in harmony with the world. Realizing inner peace can make one perceive the world with contentment and appreciation. I would love to share my work to you about how one can change from within by realizing his/her inner peace and become a better person. Please take time to visit my website at http://www.iamthechangeiseek.org . Thanks, Karen! So glad you found us and are enjoying what you find here.